And we’re back! Seriously, after reading that load of crap from yesterday I’m shocked that you’re subjecting yourself to more. Guess you too needed an excuse to try something new in the vast world of beer. Well, today is Tuesday so let’s try to figure out just what it is we’re getting ourselves into. Tuesday is the first day dedicated to the planets, and this day is reserved for that little red wasteland known as Mars. Quick, what first comes to mind when you think of Mars? I knew it – it’s Total Recall! 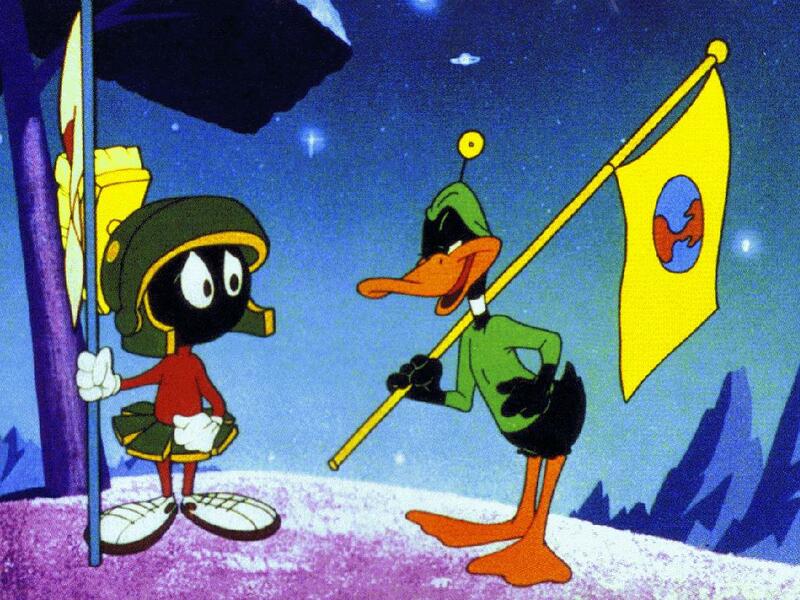 Oh, sorry, was it Marvin the Martian? I’ll just blame the image at the left for that sensory cue. Anyway, Mars is of course a planet but Mars (The dude) was also better known as the Roman God of War. For us English-speaking folks, maybe we should look to the Germanic God of War, Tiu, to really understand why this day works out to be Tiu’s Day (See, it’s Tues-Day). So, let’s figure out what beer we’re drinking to pay homage to the mighty God of War! I thought about going all crazy with this and using blood lust in my search for a beer that represents war and carnage. In light of recent events though, like real war, I think I’ll just go for a play on words and seek out a beer that uses Mars in its title. Bière de Mars is actually a real thing, but it has nothing to do with the planet Mars nor does it have anything to do with Gods and/or war. It’s a Bière de Garde that was traditionally brewed in the Winter months and re-fermented in storage until it was released for the masses in early Spring, or March if you will*. Yup, Mars in this sense is just French for March. Well, now that we’ve got Bière de Garde in our minds let’s find a beer that’s worthy of our Tuesday Beer of the Day. *By masses, I of course just mean the residents of the thatched huts surrounding the brewery. There were no masses in pastoral times, unless you consider sheep and cows masses. Today, I’m going with Brewery Ommegang’s Bière de Mars. I shouldn’t have to tell you that virtually anything that has or ever will come out of Ommegang is or will be quite delicious. Bold statement, but until I’m proven wrong I’ll stand by that. Ommegang’s take on the Bière de Garde even has the planet Mars on the label, so I think they win over any French bottlers since it relates better to my story. Jenlain’s Bière de Mars is probably the best example of the Bière de Garde style that I know of, but I’m sticking with Ommegang on this one just for the simple fact that they introduce Brett yeast and really push the funk. Oh right, I guess it doesn’t really matter what beer I’m choosing since I just want to find a style that I don’t normally drink. I think you’ve figured out what style that is for Mars Day. Bière de Garde is a fun style and being that today is March 22nd I find no reason that you shouldn’t be heading out to your local package store to pick up a bottle tonight. It’s the perfect beer to go with the season. I’d go with Ommegang myself, or New Belgium’s version if you’re lucky enough to be in their distribution area, but any French bottling that you can find should be just fine. 3 Monts from Saint-Sylvestre is perfect if you’re looking French, Gift of the Magi from Lost Abbey is perfect if you’re looking domestic. Again, try something new. I’m sure we’ve all had Bière de Garde at one time or another, but how many of us can really say that the style is a regular in our rotation. So go my friends. Go try new beer. Don’t forget to come back tomorrow to see if I remember to write up another post dedicated to Wednesday. We’re talking Woden, Odin, Mercury, and anything else that might lend itself to the day better known round the world as Hump Day. Posted in WTF.Tagged Beer of The Day, Biere de Garde, Biere de Mars, Day of Mars, God of War, Ommegang, Tuesday. Next Post VIVA LA REVOLUCION!